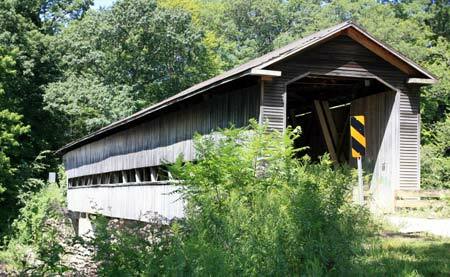 Ashtabula County is the largest county in Ohio with 705 square miles and great place to spend some vacation time exploring the 16 covered bridges, 19 museums and historical landmarks, and 17 campgrounds. It's no reason it's call "Ohio's Corner on Fun!" 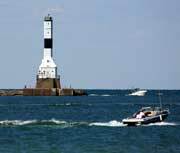 Ashtabula County is located on the shore of Lake Erie in the extreme northeast corner of Ohio and only about an hour from Cleveland. Features Bridge Street which is lined with shops and fine places to eat and drink. The famous Lift Bridge which goes up every half hour to allow boats in and out of the Harbor, is especially attractive at night. Historic Bridge Street is a National Registered District of Historic Places, located in Ashtabula Harbor. It offers a great place for shopping fine restaurants, beaches, marinas and museums. Shops are open daily, year round. Crossing the Ashtabula River is the Bascule Lift Bridge which operates 24 hours a day. The bridge is lifted every half hour. Due to its unique structure and history the bridge was added to the National Register in 1976. 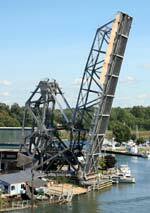 The term "Bascule" is a medieval term for draw bridge. In 1890s, Thomas E. Brown, designed the first lift bridge. Brown is perhaps better known for designing the original elevators of the Eiffel Tower in Paris. 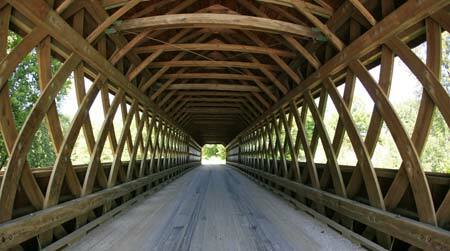 A new bridge was built in 1925 and remains in operation today. It was first restored in 1986 and is currently undergoing a second restoration. Ashtabula County still has 17 picturesque covered bridges that date back to the 1850s that still cross some of the most scenic rivers and streams in Ohio. Built in the 1840s by William and Katherine Hubbard. 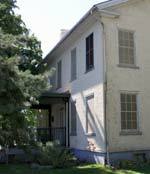 The Hubbard's used their house as a final stop on the Underground Railroad. The house was referred to by escaping slaves as "Mother Hubbard's Cupboard." From this house the slaves walked the 1/4 mile to the Hubbard & Company warehouse along the river where friendly boat captains would ferry the runaways to Canada. Ashtabula County had over 30 known Underground Railroad stations. Artifacts on display include Revolutionary War, the War of 1812, and the Civil War as well as memorabilia of the area. Hubbard house is located at the corner of Walnut Boulevard and Lake Avenue. Hours: Fridays through Sundays 1-5pm, Memorial Day weekend through the end of September. Admission: adult $5, seniors $4, children $3 (6-16). Housed in the former residence of Ashtabula Lighthouse keepers and also at one time the Coast Guard Chief. The house was built in 1871. The museum contains models, paintings, marine artifacts, photos of early Ashtabula Harbor and ore boats and tugs, miniature hand-made brass tools that actually work, and the world's only working scale model of a Hulett Ore Unloading Machine. Located on the west side and overlooking the Ashtabula River near Point Park. Hours: Fridays, Saturdays, Sundays & Holidays (Memorial Day weekend - August: 12:00 p.m. -5 p.m.
September: 12:00 p.m. - 5 p.m. Saturday and Sunday only. 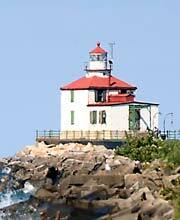 The Ashtabula Lighthouse built in 1905, was manned by the Coast Guard until 1973. At that time, it was the last remaining manned light on Lake Erie. That same year, the keeper’s residence, which was serving as Coast Guard housing, was deeded over to the City of Ashtabula. The city’s original plan was to convert the dwelling into a “Western Reserve and Marine History Museum,” commemorating early Indian life. However, due to a lack of sufficient funds the property defaulted back to the federal government in 1976. 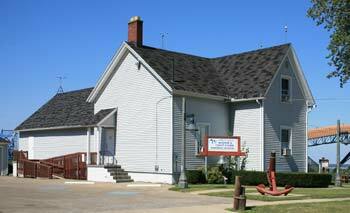 Today the keepers house houses the Marine & Coast Guard Memorial Museum. Conneaut is about as far northeast in Ohio possible without landing in Pennsylvania. Located along an old Native American hunting trail, the town got its name from the small stream that flows into Lake Erie.